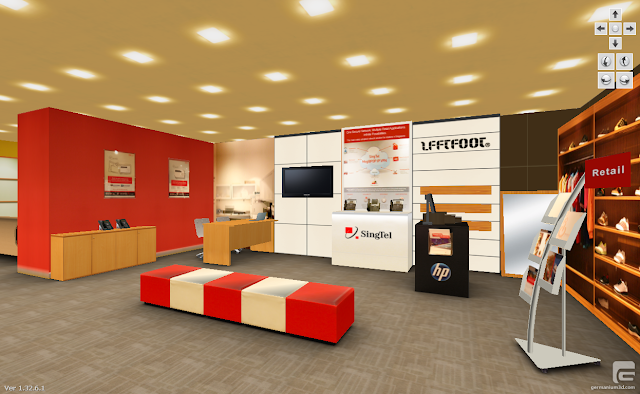 The Singtel Business Solutions Centre (BSC), located at the Comcentre, provides a diverse showcase of innovative Singtel ICT solutions and services to business visitors. The Conveno 3D Visitor Guide is deployed as a touch-kiosk solution for the Singtel Business Solutions Center. Note: No online demo is available. With Conveno, business visitors at the Business Solutions Centre are now able to conveniently experience virtual business tours of the Satcom@SMA (at Singapore Polytechnic) and the Broadcast Innovation Centre (at Bukit Timah), without having to physically travel to the respective locations. In addition, our clients are now able to easily present a location overview of the solutions found at the Business Solutions Centre to a seated business audience. In the event where there is insufficient time for the audience to physically tour the centre, our clients are able to use Conveno to provide a quick and exciting virtual tour of the Business Solutions Centre. our clients are able to use Conveno to provide a quick and exciting virtual tour of the Business Solutions Centre.